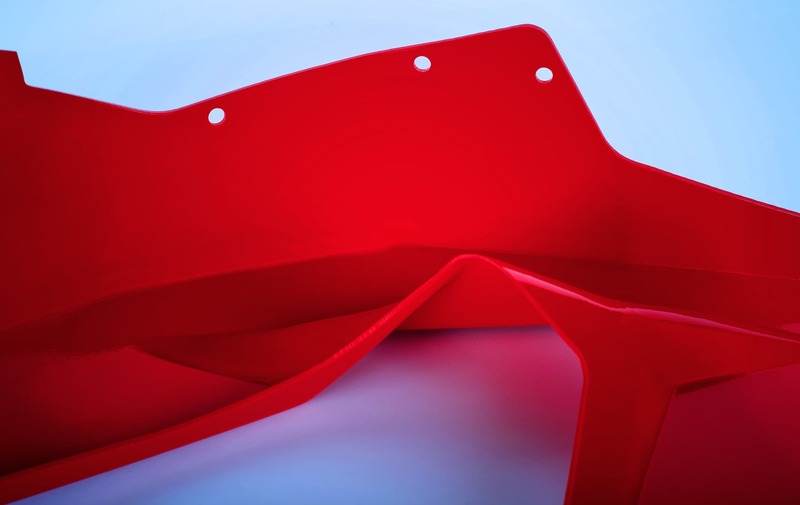 At Ray Products, we have been creating 3D thermoformed plastic parts for our clients, including those in the medical device manufacturing industry, for more than 65 years. But with the latest developments in pressure-forming technology and the proven benefits to the medical device manufacturing sector, we’re making the industry a special focus in 2018. Most recently, our President, Brian Ray, and our Vice President of Sales & Development, Jason Middleton, led a Medical Design and Outsourcing webinar about the benefits of pressure forming medical device enclosures. Throughout the webinar you’ll learn about the significant cost savings associated with pressure forming as well as the aesthetic and performance improvements of pressure-formed medical devices. The 45-minute webinar covers the entire pressure-forming process-from design and tooling to material selection to trimming and finishing-going over anything an engineer or industrial designer may need to know about pressure forming medical device enclosures. If you weren’t able to attend, you can find it here: Medical Design and Outsourcing webinar. To kick off February, we’re heading back to MD&M West, a three-day industry event where the best minds in medtech and manufacturing meet to share insights, discuss industry challenges and discover the latest innovations that are reshaping the industry. 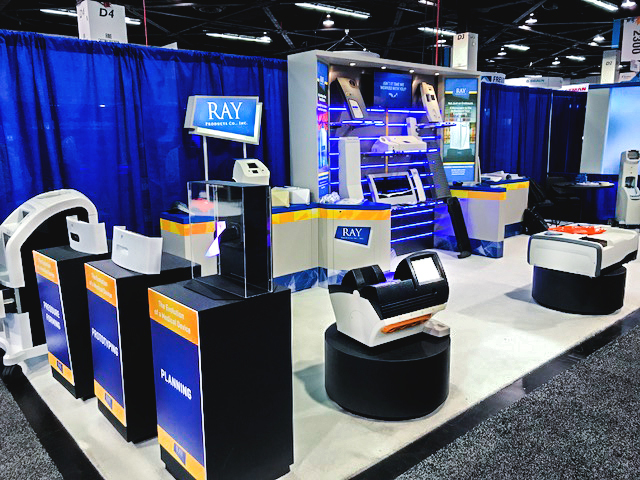 MD&M West takes place February 6-8th in Anaheim, Calif. We’ll be there to answer questions and demonstrate some of the many capabilities and advantages of pressure forming medical devices. 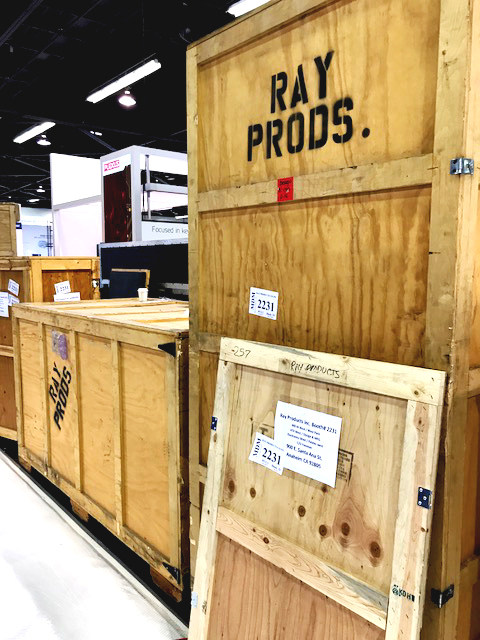 If you’re attending MD&M West, we’d love to see you there. Stop by booth #2231 to chat about any challenges you may be experiencing, and we’ll see how we can help! This week, we made our first appearance as exhibitors at DeviceTalks West in Costa Mesa. DeviceTalks are a series of three events held annually in Boston, Minnesota and Orange County, CA. They’re hosted by MassDevice.com, which is described as the “journal of record for the medical device industry.” Compared to other medical device conferences, MassDevice is a bit shorter (just two days), and perhaps more focused on presentations from big-name keynote speakers. The 2017 Orange County program was split between two tracks, one called “Building Better Companies,” targeted at senior executives; and another named “Building Better Products,” targeted at engineering managers and their teams. 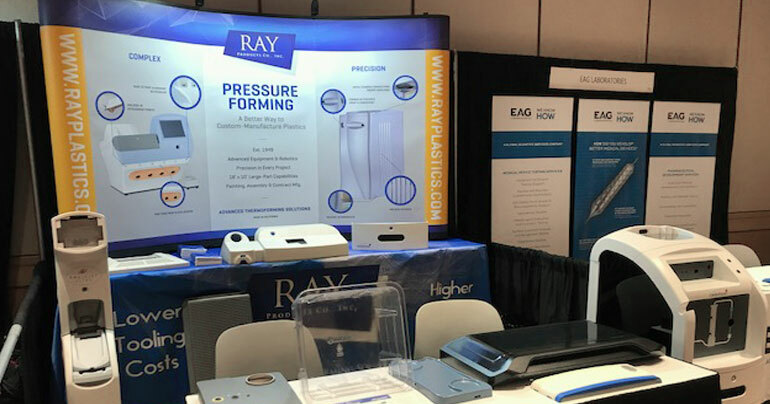 We’ve been working with medical device manufacturers throughout the history of our company, but recent advances in pressure-forming technology and our own experience in that industry have made the medical device manufacturing sector a special focus for Ray Products. With that in mind, and the show’s location in our own backyard, showing up this year seemed like a no-brainer. If you missed us at DeviceTalks, you can see us at MD&M West in Anaheim February 6–8. We’ll be there to answer questions about pressure forming medical devices, demonstrate some of the process’s capabilities and advantages, and help attendees solve any challenges they may be experiencing. Chances are, you’ve been lied to about the capabilities of thermoforming. Those lies probably weren’t intentional. They may have come from sources with an outdated or incomplete understanding of pressure forming and vacuum forming as a process. Wherever those lies came from, it’s time to learn the truth. And there’s no better place than the webinar we’ll be hosting in partnership with Design World on November 9 at 4 p.m. EST / 1 p.m. PST. We’ll address the most commonly told lies about thermoforming, and share truths that you can use to cut costs, improve aesthetics and performance, and slash your manufacturing timetables with thermoforming. 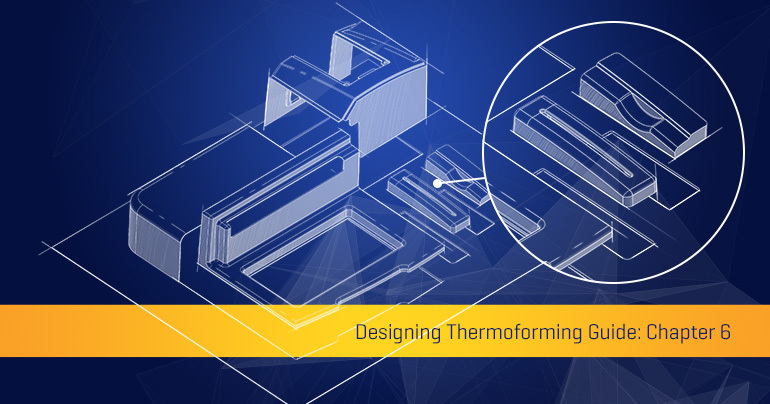 This is the seventh post in our series from our Thermoforming Handbook, a guide that, until now, was only available to our customers and partners. We’re releasing the whole thing in a series of posts right here on our blog. If you’re someone who uses custom plastic manufacturing professionally and you’re interested in getting your own copy, just send us a message and we’ll be happy to send you one. As always, these are general guidelines. Any project or design needs to be reviewed by a qualified thermoforming professional before it goes into production, and the sooner you get one of those qualified professionals involved in the process, the smoother things tend to go. If you’re looking for a qualified professional, we know a few who would be happy to help. The last part of the thermoforming process is finishing. This term can encompass anything that happens after the final part is trimmed, including painting, silk-screening, the attachment of fasteners and in some cases even assembly and logistics. Sure, you can thermoform in color, but there are a few reasons you still might want to consider painting. Silk-screened text, images and logos can be used to brand, label and improve the aesthetics of thermoformed parts. EMI/RF Shielding – Special copper paint, used to block interference from electronic devices. Hot Stamping – A process where metal foil text or graphics are permanently affixed to the thermoformed plastic. Plating – Plated plastic is plastic that has been covered in a metal coating for the purposes of EMI/RF shielding, ESD prevention, wear resistance or a thermal or chemical barrier. Embossing/Debossing – A process where heat is used to make a 3D impression/depression on the plastic, for a detailed feature like a logo or graphic. Bosses, inserts and other fasteners are attached with adhesive during the finishing process. They offer significant design flexibility, but can also increase costs. Pressure forming allows for molded attachment points like tabs, counter- bores or counter sinks. Fastening is one of the most important issues to address in the design ofplasticparts.Inthermoforming,itisnotpossibletomoldina boss or insert without it being visible on both surfaces of the part. Many types of fasteners and attachment options are available, and we are ready to work with you to meet the fastening requirements of your parts. Molded-in features like snap-fits, tabs and receiving slots are affordable fastening options, and don’t generally add significantly to the total project cost. Bonded bosses with inserts can help to form a secure attachment between two parts, but they do add some costs to building the part. Unlike injection molding or other processes, our bosses can be added, subtracted or moved without any impact to tooling. Have questions about finishing on your next thermoforming project? We’d be happy to help. Get in touch today. 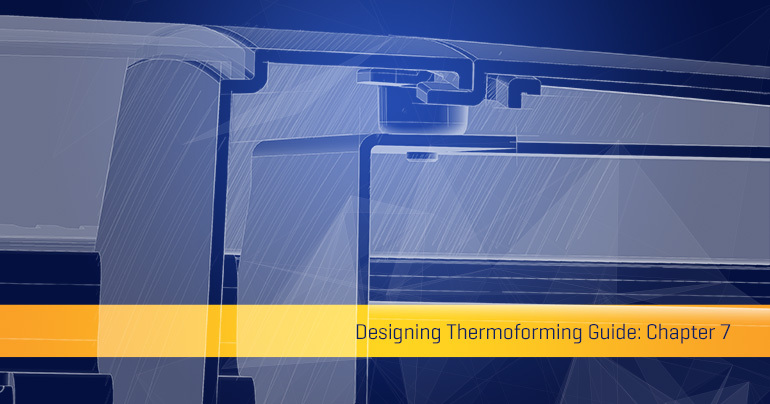 This is the sixth post in our series from our Thermoforming Handbook, a guide that, until now, was only available to our customers and partners. We’re releasing the whole thing in a series of posts right here on our blog. Every part that comes out of a thermoforming machine must be trimmed. In 1949 when Ray Products was founded, this process was carried out with hand tools. Today, we use high-precision 6-axis trimming robots to carry out the process quickly, and cost-effectively. 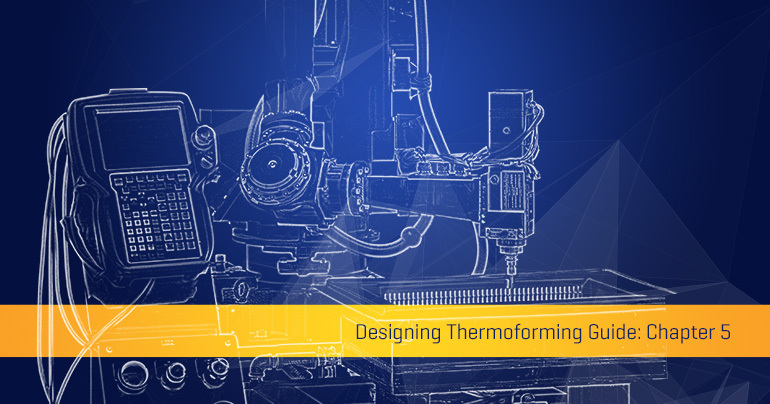 This is the fifth post in our series from our Thermoforming Handbook, a guide that, until now, was only available to our customers and partners. We’re releasing the whole thing in a series of posts right here on our blog. Open up an engineering textbook, and it’ll likely define tolerances as the “permissible limit or limits of variation.” To put it more simply, how close to your exact specification can you expect the final product to be? Every manufacturing process has unique tolerances, and thermoforming is no different. It’s important to note that what we’re listing here are industry standard thermoforming tolerances. If you have a project that demands tolerances tighter than what is standard in the industry, we’d be happy to hear from you. Our team loves a good challenge. 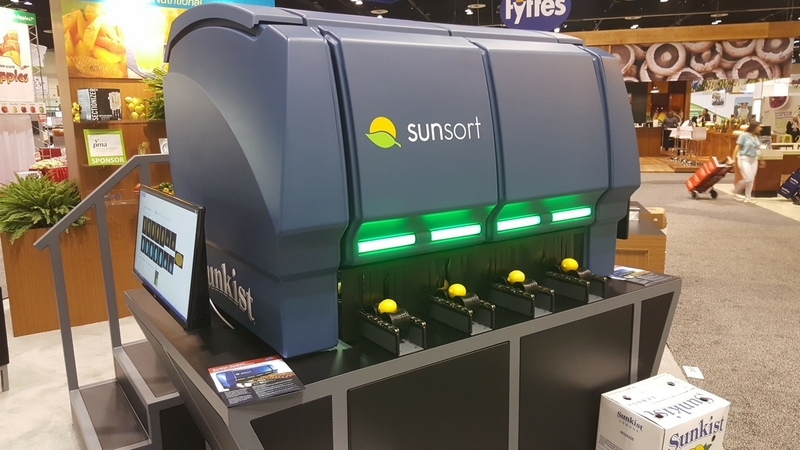 For people in the citrus industry, it’s common knowledge that Sunkist’s SunSort line of citrus sorters are the top of the line. So when the company was ready to upgrade the enclosure on its latest model from in-house sheet metal to a modular thermoformed design, we were thrilled to help. The new thermoformed designs were able to help Sunkist improve durability, cut manufacturing costs and time, and help the new units stand out from the competition. But don’t just take our word for it. Head over to Plastics News, where you can read the whole story. Essentially, it’s one measure of how advanced each country’s manufacturing sector is. 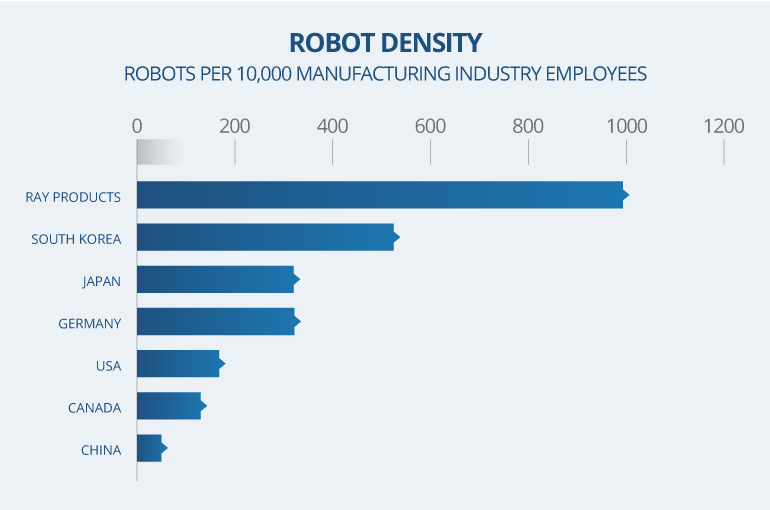 China, with just 49 robots per 10,000 manufacturing industry employees, is at the low end. South Korea, with 531 robots per 10,000 employees, is at the top of the chart. The United States, with 176, is somewhere in the middle. So, we wondered how we stacked up. It turns out that, if Ray Products were a country, we’d have the most advanced, most automated manufacturing sector in the world. After a busy couple weeks at trade shows, we’re back in the office and we’ve had a chance to think back on Design2Part Santa Clara, and Design2Part Minneapolis. Both shows were great, and we’re hoping to be back next year. There’s a reason housing prices set new records just about every year in the Bay Area. Spending 4 days there was a treat. We had a chance to meet with several of our existing customers, get updated on their progress and get excited about their plans for future growth. It was our first chance to show off a brand-new tradeshow booth, and the reviews were all positive. We got to meet a few potential new customers, and it’s always exciting to be able to help people build new things. We can confirm that “Minnesota Nice” is absolutely a real thing. We combined the trade show with several visits to existing and potential customer facilities. We had an annual business review where Ray Products scored in the top 4 total suppliers in quality, on-time delivery, engineering and purchasing support. We managed to hit Brit’s Pub for the opening day of lawn bowling. It was a crazy few weeks, and it’s great to be home with a ton of good memories and a busy schedule of projects from familiar, and new customers. We’re looking forward to doing it again next year.